If Alice, the White Rabbit, and Queen Victoria wanted to play a word game, what could be more fun than a riotous game of ALPHABET ROUNDABOUT. Players spell words using cards from their hand, on the table, or on the floor. Scoring moves your playing piece around the zig-zag "Ruffle" on the game board. Play is competitive, fast-paced, and just a little wild. 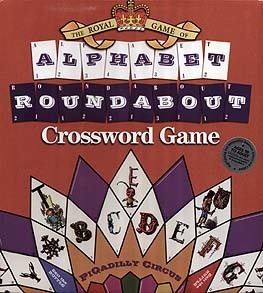 Players race into "PiQadilly Circus" in the centre of the board, to be the first to dine with the Queen and win the game. Pieces change size, players get "bumped," letters on the game board can be used for bonus scoring, and if you spell "QUEEN" the game is over - and you win! There's never been a world game quite like this - it will leave you just a little bit breathless! A challenging crossword-style word game created in the spirit of Victorian whimsy. Skilful WORDPLAY will have you "Riffing along the RUFFLE" in your race to PiQadilly Circus.